Antony Osler, on his stoep, the radio close by. Antony Osler is a Zen Buddhist teacher. He is a writer. He is a builder and a carpenter. 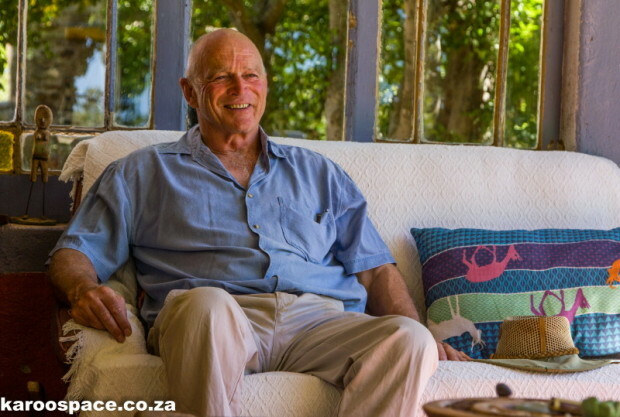 With his wife Margie, he is a farmer and a self-confessed stoep-sitter. It’s very seldom that he calls himself a lawyer. “I usually deny it,” he jokes. But it is his job arbitrating labour disputes that puts him on the road between small Karoo towns. And it is these dirt road journeys that have resulted in his latest book, Zen Dust. 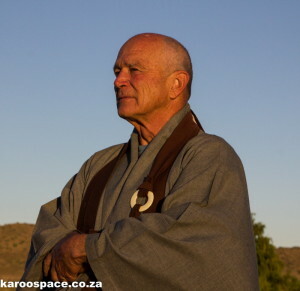 His first book, Stoep Zen, was an unexpected success. Published by Jacana in 2008, it is now in its fourth reprint, which practically constitutes best-seller status in South African publishing. Zen Dust is similar in that clarity, humour, wisdom and a kind heart shine through every beautifully written page. But this book ranges wider and in many ways, goes deeper than Stoep Zen. It threads together encounters, insights, and haikus as Antony travels from Kimberley to Koffiefontein, Fauresmith, past Luckhoff and Jagersfontein, to Philippolis, Colesberg and home to Poplar Grove farm on the Oorlogspoort road. 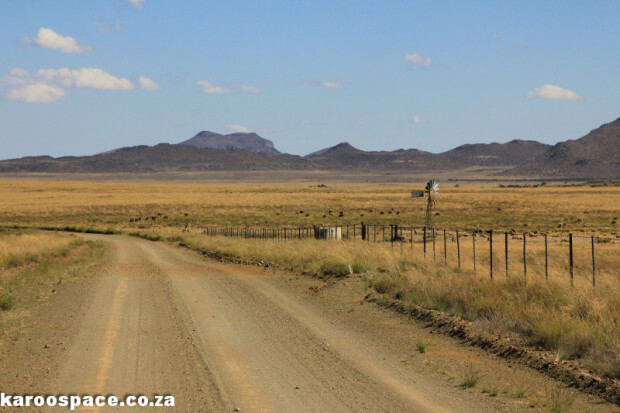 The Oorlogspoort road to Poplar Grove Farm near Colesberg. “I just love writing,” says Antony. “I love the long hours of focused solitude and am so grateful to live with someone who understands this. I love the relief of cutting and throwing away words, I love the shaping and meticulous care of it all. Poplar Grove is one of the smaller farms in the district, bought by Antony’s grandfather decades ago, and named for the long thicket of trees between ironstone hills. The farmhouse, built in 1850, is lowslung and has with two splendid stoeps. One overlooks the distant poplars that gave the farm its name, and the other one has a view over the sheep-dotted plains, all the way to the far horizon. 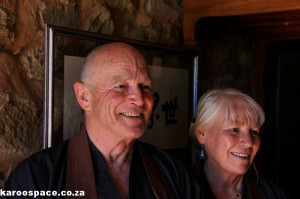 Antony and Margie Osler, Zen Buddhists in the Karoo. At the bookends of the day, this is generally where Antony and Margie can be found, with coffee or tea in the morning, wine or whiskey at sunset. Their nearby self-cater guest cottage, which was a pump house in a previous incarnation, also has a broad stoep. There is no better place for slow conversation and companionable silence. The Aermotor windpump nearby spins and sighs, pulling fresh cold water from the earth, a cupful at a time. From here you can contemplate the dassies scampering up and down the koppie, the bright weaver birds in the willows and a scrub hare that may appear in the early morning. When Margie and Antony met nearly thirty years, he was already a Buddhist. He spent three years at a Zen Buddhist monastery, shaving his head and donning robes at Mount Baldy in California. Singer Leonard Cohen was also a monk at this same monastery – one of the many reasons Antony loves his music. Antony Osler spent three years in a Zen Buddhist monastery. Their home is graceful and full of books. There is no television, much less DStv. Only the workers have that, and Antony will sometimes go and watch an international match with the Januarie family, chickens wandering between their feet. Four times a year, dozens of people descend on Poplar Grove for week-long retreats, and then every available space is taken. At retreats and throughout the year, everyone meditates in the old stone shed, which has been transformed into a meditation hall. In between the Zen Buddhism weeks, there are altogether noisier retreats. Margie is a remedial teacher, and with money donated by guests, she brings in traumatised children for weekends of happiness. They swim in the farm dam, run on the lawn and get all the attention they need. The children are between seven and 14, identified by the nearby Hantam Community Education Trust. They have difficulty coping because their lives revolve around issues of loss (many have lost one or both parents) and conflict in their homes. “The first few times, the children would horde food. Obviously they’re fed irregularly at home. We’re planning the next weekend for the beginning of the school term because we’ve found the children are most in need of therapy after the holidays, when they’ve been at home for an extended period,” says Margie. 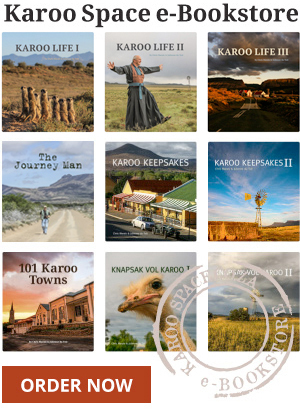 This is an extract from Karoo Keepsakes II – The Journeys Continue. You’ll often find Antony working with wood, listening to the radio. Antony and Margie in their robes, meditating in the Zendo. Antony Osler, up at first light. The Aermotor spins and sighs, pulling up a cupful of fresh water at a time. The meditation hall (Zendo) used to be a farm shed. The Buddha of the former sheep-shearing shed. Poplar Grove’s little self-cater cottage. Margie and Antony Osler – coffee with a view. The stoep – a place that invites contemplation. Nice article. What a lovely life that seems so far away from my busy and stressed job here in the UK. Would love that calmness and the mention of “Stoep sitting” takes me back to farm days with mum. I was at Epworth with your sister in law Les. She and Anne Hill have given me your books and I have read them over and over again. I have been practicing Zen since 1994, first went to the Zen mountain Monastery and now attend sesshin at Chapin Mill with the Rochester Zen Center. I have lived in the US since 1971. As a South African and a Buddhist I treasure what you have written. The story of the petrol attendant singing opera always brings me to tears. What are the dates for sesshin on your farm? I bring tour groups to South Africa 3 times a year and would love to plan a visit for a time when I could attend sesshin. Thanks for your books. They are amongst my most loved possessions. Sitting in my study in noisy Hanoi, your story makes me yearn for the solitude. I spent some time in a forest monastery in North Eastern Thailand, and look forward meeting you when I return to South Africa.